Invar, also known generically as FeNi36 (64FeNi in the US), is a nickel–iron alloy notable for its uniquely low coefficient of thermal expansion (CTE or α). The name Invar comes from the word invariable, referring to its relative lack of expansion or contraction with temperature changes. It was invented in 1896 by Swiss physicist Charles Édouard Guillaume. He received the Nobel Prize in Physics in 1920 for this discovery, which enabled improvements in scientific instruments. Like other nickel/iron compositions, Invar is a solid solution; that is, it is a single-phase alloy, consisting of around 36% nickel and 64% iron. Common grades of Invar have a coefficient of thermal expansion (denoted α, and measured between 20 °C and 100 °C) of about 1.2 × 10−6 K−1 (1.2 ppm/°C), while ordinary steels have values of around 11–15 ppm. Extra-pure grades (<0.1% Co) can readily produce values as low as 0.62–0.65 ppm/°C. Some formulations display negative thermal expansion (NTE) characteristics. Though it displays high dimensional stability over a range of temperatures, it does have a propensity to creep. In land surveying, when first-order (high-precision) elevation leveling is to be performed, the level staff (leveling rod) used is made of Invar, instead of wood, fiberglass, or other metals. Invar struts were used in some pistons to limit their thermal expansion inside their cylinders. In the manufacture of large composite material structures for aerospace carbon fibre layup molds, invar is used to facilitate the manufacture of parts to extremely tight tolerances. Inovco, which is Fe–33Ni–4.5Co and has an α of 0.55 ppm/°C (from 20–100 °C). FeNi42 (for example NILO alloy 42), which has a nickel content of 42% and α ≈ 5.3 ppm/°C, is widely used as lead frame material for electronic components, integrated circuits, etc. A detailed explanation of Invar's anomalously low CTE has proven elusive for physicists. All the iron-rich face-centered cubic Fe–Ni alloys show Invar anomalies in their measured thermal and magnetic properties that evolve continuously in intensity with varying alloy composition. Scientists had once proposed that Invar's behavior was a direct consequence of a high-magnetic-moment to low-magnetic-moment transition occurring in the face centered cubic Fe–Ni series (and that gives rise to the mineral antitaenite); however, this theory was proven incorrect. 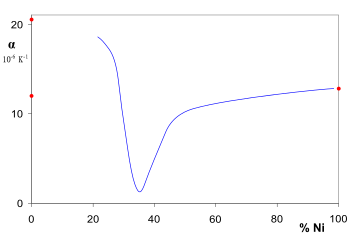 Instead, it appears that the low-moment/high-moment transition is preceded by a high-magnetic-moment frustrated ferromagnetic state in which the Fe–Fe magnetic exchange bonds have a large magneto-volume effect of the right sign and magnitude to create the observed thermal expansion anomaly. ^ Davis, Joseph R. Alloying: Understanding the Basics. ASM International. pp. 587–589. ISBN 0-87170-744-6. ^ "The Nobel Prize in Physics 1920". nobelprize.org. The Nobel Foundation. Retrieved 20 March 2011. The Nobel Prize in Physics 1920 was awarded to Charles Edouard Guillaume "in recognition of the service he has rendered to precision measurements in Physics by his discovery of anomalies in nickel steel alloys". ^ "Material Data Sheet Alloy 36" (PDF). Retrieved 24 November 2017. ^ "Nickel & Its Uses". Nickel Magazine. Nickel Institute. 3 May 2005. Archived from the original on 19 December 2010. Retrieved 20 March 2011. ^ Tooling to mould and die for!, Mike Richardson, Aerospace Manufacturing, 6 April 2018, accessed 10 April 2018. ^ K. Lagarec; D.G. Rancourt; S.K. Bose; B. Sanyal; R.A. Dunlap (2001). "Observation of a composition-controlled high-moment/low-moment transition in the face centered cubic Fe–Ni system: Invar effect is an expansion, not a contraction" (PDF). Journal of Magnetism and Magnetic Materials. 236: 107–130. Bibcode:2001JMMM..236..107L. doi:10.1016/S0304-8853(01)00449-8. Archived from the original (PDF) on 25 April 2012. ^ D.G. Rancourt; M.-Z. Dang (1996). "Relation between anomalous magneto-volume behaviour and magnetic frustration in Invar alloys". Physical Review B. 54 (17): 12225–12231. Bibcode:1996PhRvB..5412225R. doi:10.1103/PhysRevB.54.12225.